Sometimes you may need to delete transactions from your account, for example if you uploaded the wrong data or if you have duplicate transactions. On your dashboard, click All Transactions at the top. If need be, use the search bar to filter transactions, for example by a certain exchange. Click the checkboxes next to the transactions you'd like to delete. 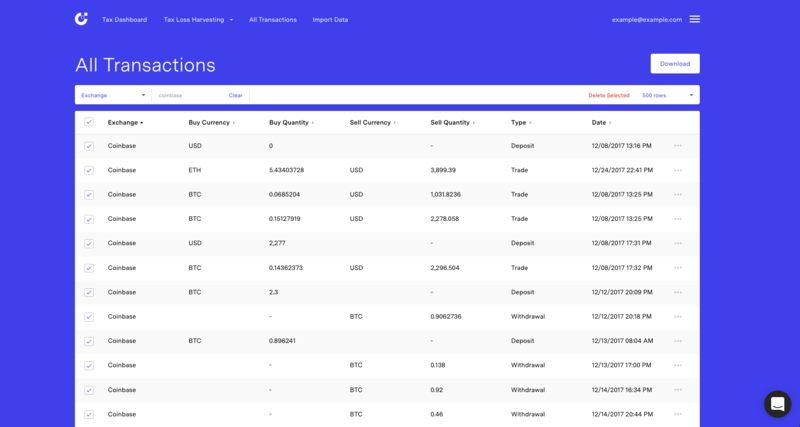 Select the top left box to select all transactions on a page, at the top right selecting more rows at a time to display if you want to delete more. Click Delete Selected at the top right of the table. Now you're all set to re-upload the right data.